The Aspire 4730 with 14" HD display is ideal for carefree multimedia enjoyment and communication on the go. If you’re looking for a versatile notebook for home use, the Aspire 4730 could be it. 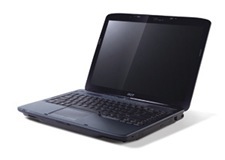 The Acer CrystalBrite 14.1” display offers viewing pleasure, and power is provided by an Intel dual-core processor. Acer InviLink Nplify 802.11b/g/Draft-N WLAN, WI-FI CERTIFIED. "USB\VID_03F0&PID_171D", "USB\VID_03F0&PID_D104", "USB\VID_03F0&PID_D404", "USB\Vid_0A5CΠd_2110", "USB\Vid_413CΠd_8126", "USB\Vid_413CΠd_8130", "USB\Vid_0A5CΠd_2120", "USB\Vid_0A5CΠd_2121", "USB\Vid_0A5CΠd_2123", "USB\Vid_047DΠd_1154", "USB\Vid_044EΠd_3010", "USB\Vid_0A5CΠd_2112"